We’d love your help. Let us know what’s wrong with this preview of Sideshow at Honey Creek by Steven D. Malone. Sideshow at Honeycreek is a story of the desperate struggle for survival on the Texas frontier during the last bitter winter of the Civil War. It chronicles the efforts of the Ike Burns family and their friends in a grim fight against the elements, Union agitators, the Comanche, Confederate indifference, and sometimes each other on the very edge of western expansion in lat Sideshow at Honeycreek is a story of the desperate struggle for survival on the Texas frontier during the last bitter winter of the Civil War. It chronicles the efforts of the Ike Burns family and their friends in a grim fight against the elements, Union agitators, the Comanche, Confederate indifference, and sometimes each other on the very edge of western expansion in late 1864. The events are true and the main characters are based on the lives of real people. The author has done his job recreating the era and basing his story on original research and actual events. To ask other readers questions about Sideshow at Honey Creek, please sign up. Fine historical novel based on the January 1865 Battle of Dove Creek and related events. The battle itself was a mistake. The Texans and a few Confederate troops thought they were attacking a large, hostile Comanche encampment. Attempting to make up for their lack of numbers with surprise, the Texans attacked without parlay which would have revealed the truth - the encampment was of peaceful, but highly competent warrior, Kickapoo Indians. If the Indians had been Comanches, attempting parlay may very well have been suicidal. In this novel, the Kickapoos are not entirely innocent as their encampment includes a group of notorious and vicious Jayhawkers come south searching for victims. The fighting is brutal, no quarters stuff which is vividly described. The story is told from the viewpoints of several characters and switches amongst them freely and often. This is an interesting story of a minor Civil War sideshow which drives home the fact that there is nothing minor about it to those caught up in it. Mr. Malone wrote a sort of sequel called SOUTHING which I read first. The only problem with that being that you know that several of the characters survive to appear in that novel. Both novels are available through Kindle Unlimited. In Sideshow at Honey Creek, Steven Malone presents an engaging tale inspired by true events that occurred in Texas in the waning months of the Civil War. In a setting largely ignored by most novelists and Civil War historians, Malone shares the story of a guerrilla war waged on one side by a rogue Federal Army manipulating Native American Tribes and, on the other side, valiant but outnumbered ranchers along with a small, yet determined, remnant of the mostly depleted Confederate Army. Malone takes what some authors might treat as a documentary and turns it into a riveting story filled with action and a variety of colorful and interesting characters. If you are a fan of westerns, action/adventure, and/or historical fiction, Sideshow at Honey Creek has all of that in one story that will keep you pushing the "forward" button on your e-reader even as you have chores that need doing. If you are into comfort and ease, this book may not be for you. But if you want to feel the sleet stinging your face or the summer sun burning your skin as you ride through Texas, Malone delivers. I noted in reviews from other readers some concern about typos and proofreading errors. With this re-edited and re-proofed edition, I noted only very rare such instances and those few that remain detract not at all from a compelling story. My recommendation - buy it, read it. It's that good. I really liked this book, very well researched and interesting. Always good to find out something new, l had no idea about this battle. A big thanks to the author and please keep them coming. Sideshow at Honey Creek is a very good historical novel dealing with events in Texas during the American Civil War. The book tells stories at several levels. It describes the life and struggle of Texans along the Western Frontier during the Civil War at a time when the usual systems of protection against Indians and lawlessness had more or less collapsed. 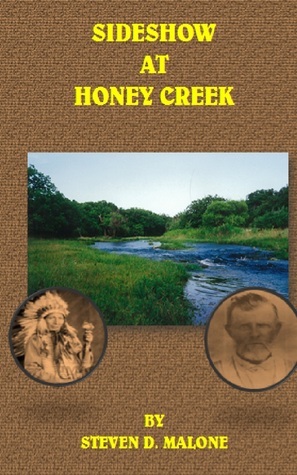 It tells the tragic story of the little known Battle of Dove Creek in which hundreds of whites and over thousand Indians fought a fierce battl Sideshow at Honey Creek is a very good historical novel dealing with events in Texas during the American Civil War. The book tells stories at several levels. It describes the life and struggle of Texans along the Western Frontier during the Civil War at a time when the usual systems of protection against Indians and lawlessness had more or less collapsed. It tells the tragic story of the little known Battle of Dove Creek in which hundreds of whites and over thousand Indians fought a fierce battle. Many died. First of all it is a gripping story about people who experienced these dramatic events. The events and the characters are thoroughly researched by the author, and the story is very well written. It is told through the experiences of several different historical (and a few fictional) persons whose destinies are closely interwoven. This is very professionally done. In many ways the book is worth five stars. Still, I give it four. The reason is that I at the start of the story had trouble in following the thread. For me the book referred to too many unknown generals, places and events, and in the beginning I also got confused by the frequent changes of perspective. This, however, was of course partly due to the fact that I have little knowledge of the American Civil War: its generals, battles, and geography, but I'm probably not the only reader who knows little about American history. My troubles are also related to a formatting shortage. The e-book I read had no Table of Contents, and too late I discovered that the book had an afterword in which most of the context of the story is explained. This afterword I could have used before I started reading. In addition to this, the book has a lot of other formatting problems, especially with indentations. On the other hand, when I read Sideshow at Honey Creek, I really experienced the advantages of e-books. I read a Kindle version on my iPad, and knowing little of 19th century military activities, I had immediate access to dictionary explanations of unfamiliar words. And more importantly: Without leaving the reading application, by pointing to the words, I could easily find information on historical persons and places on Wikipedia. The Republic of Texas during the American Civil War. You are in the middle of a battle, led by General A.E. Lee. Tomahawks are flying, Comanche Indians. The beginning of the book is a little confusing. You're thrown into the action immediately, which leaves you a little bewildered. But luckily, it lasts only for the first few pages until you become accustomed to the authors style, a little graphic at times, especially the war scenes, mostly dialogue. Here's one line that resonated with me,"The war made old men of little boys" It made me think, what being in a civil war was really like for a young man back in those days. I'm sure very scary. Some of the scenes, Steve has written as if he were right in the middle of the thick of things, a little shocking. The Indian not being painted in a good light, but that was then and this is now. Two different stories. And I'm almost sure that's how it was back then. War was war. I'm reading this book on my computer, and have noticed the formatting needed a little more work and some copy editing. But not a problem! It's not that distracting. A lot of research went into writing this book you can tell. Not that I would know any difference. The story stands by itself. A really good book with great characters and plots, I took off the half star only for formatting and a few grammatical mistakes which after the first chapter you are completely unaware off, besides that an excellent read. A History Book. Steve sounds like a great historian, you will have to take his word it. He sounds very convincing. The book was a treasure to read. I recommend it whole heartedly. Excellent work Steven, this book got my blood circulating. Who doesn't like a good western? “Sideshow at Honey Creek” by Steven Malone is a fascinating historical find about one of the lesser known stories of American History, at least it was for me, a European. It is no surprise that the author has a degree in History, the research he must have done for this book is enormous. The big picture deals with the involvement of Kickapoo and Comanche Indians in Texas during the American Civil War. The smaller stories follow several groups of colourful characters and their personal ordeals dur “Sideshow at Honey Creek” by Steven Malone is a fascinating historical find about one of the lesser known stories of American History, at least it was for me, a European. It is no surprise that the author has a degree in History, the research he must have done for this book is enormous. The big picture deals with the involvement of Kickapoo and Comanche Indians in Texas during the American Civil War. The smaller stories follow several groups of colourful characters and their personal ordeals during this time, too many to name individually but the plot lines are well chosen and skilfully developed and the connections between these people are nicely set up. The book is a great achievement in research, execution and fleshing out of the scenes, it uses copious amount of detail, making it easy to picture the settings. It is an epic read with a lot of food for thought and has stayed with me for some time after I finished it. I received a BA in History from the University of Houston. I have been a teacher of life skills and work skills to special needs students, adjudicated youth, and the visually impaired as well as College English. I am a published author and have been a writers coach. I am a voracious reader of anything from historical fiction to cosmology to the backs of cereal boxes. My interests include ancient an I received a BA in History from the University of Houston. I have been a teacher of life skills and work skills to special needs students, adjudicated youth, and the visually impaired as well as College English. I am a published author and have been a writers coach.